You may have noticed a few changes on the site lately. The most obvious one is that I have replaced the Google Adsense advertisements with B&H advertisements that are highly targeted to this site's readers. Not only is this a better deal for sansmirror, but I think it is for you, too, as the site's ads will be much more relevant to the information you're looking at. As part of putting those ads in place, I've also had to go through every individual site page again, so I took the time to add and update articles along the way. All of the pages in the Articles and Cameras sections have already been looked at again and I've updated comments, information, and links in these sections wherever something had gone stale or out of date. I'll be doing the same for the remaining sections soon. So if you see anything that's not current, correct, or needs elaboration, let me know and I'll see if I can fit it into the big site pass I'm working my way through. There's more coming, including many more reviews, so bear with me. I've got a lot of plumbing and maintenance work I have to do first. Use the social sharing (Facebook, Twitter, Google+, email, other) links on a page. Click on advertisements and follow product links. Use the Support this Site button prior to making any Amazon purchase. I can only expand the offerings and content here if you help me out with these things. I've got plenty of new and interesting additions planned, but to get there I need your help with those three things. A big thank you to those of you who've been doing this; your support has helped this site get off the ground. Now that we have air speed, let's see how far we can make it climb. Finally, one other change: I've modified how this site deals with pre-orders in response to some of your comments. I now will link to a vendor for pre-orders as a convenience to site readers, but I also will note that this is a pre-order link and have written a pre-order page that describes what a pre-order means. 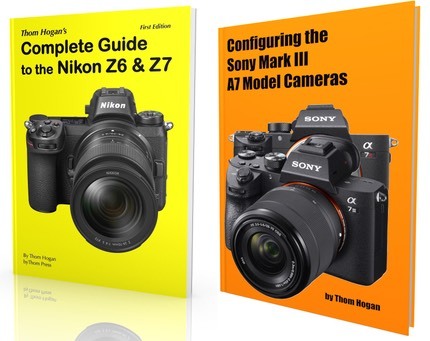 Okay, one more: I've lowered the price on the printed edition of my Complete Guide to the Nikon 1 while supplies last.